James Turrell’s enticing and mysterious Trace Elements. Everyone knows that, unless there are specific directions to the contrary, you’re not supposed to touch the works in an art museum. I wouldn’t go so far as to suggest that this is instinctive knowledge, for I have seen the extended arms of curious students who are unschooled in cultural etiquette. Those of the age of reason quickly retreat at a docent’s reprimand, but I once witnessed a harrowing incident involving a toddler who had broken loose from his mother. The boy ran right across the yellow tape line that served as a border and was soon directly underneath an installation of hanging glass sculptures by Lino Tagliapietra, his arms flailing within inches of delicately crafted suspended vessels. Everyone from the museum guard to the boy’s mother to myself turned ashen at this savage and reckless behavior. Thankfully, nothing was harmed. Outside of the very young and uneducated, however, keeping your hands off the art is a rule as obvious as the paintings on the walls. I am very much a follower of rules when it comes to observing protocol in museums. I appreciate the value and uniqueness of a collection, and I wouldn’t think of compromising any piece by contaminating it with my touch. Except once. And I must say that, in that particular instance, I am glad that I had the foolish nerve to break the rules, as what resulted was my most memorable interaction with a work of art. My brother Richard and I had spontaneously decided to visit the Columbus Museum of Art in the late winter of 1995 in order to catch an exhibit during its last weekend. It was called Landscape as Metaphor: Visions of America in the Late Twentieth Century, and it consisted of thirteen installations spread throughout the museum. In order to view each work with an unbiased eye, we decided to eschew the explanatory placards until we had first immersed ourselves in the art they accompanied. Only then would we read what the curators had to say about it. It was a decision that would make all the difference in they way I experienced one installation in particular. I was instantly intrigued by James Turrell’s Trace Elements, which required the viewer to enter a darkened, rectangular room. A pair of tungsten ceiling lamps dimly illuminated the far corners, and on the wall between them was the most incredibly vibrant blue rectangle. There was nothing more than this, lending the room the somewhat unsettling atmosphere of a desolate movie theater with no seating. We stood still in the middle of the room for a few moments and regarded the wall expectantly as if a presentation were about to begin. Nothing happened, however, and we moved forward, our tentative strides making the wooden floor creak in the otherwise silent room. As we drew closer, the blue rectangle seemed even more vivid, and I wasn’t sure if our eyes were getting adjusted to the reality of our environment or if we were being drawn into some sort of optical illusion. The canvas, or screen, or whatever it was, was not only especially bright but uncommonly pure. There was not one detail within its perimeter, not a single variation in hue, neither a shadow nor a fluctuation in intensity, just the purest and brightest blue I had ever seen. What had appeared to be a rather mundane idea upon our entrance now had me transfixed. We stepped even closer. It was an odd sensation. Instead of allowing us to perceive some small detail or imperfection, perhaps a brushstroke or a pixel, drawing nearer to the rectangle merely immersed us in more blueness. The effect was almost hypnotic yet simultaneously maddening, as my brain could not reconcile my expectations with what I was seeing. The closer I got, the nearer I should have been to the truth behind my perception, yet proximity only deepened the mystery. Soon I was drawn right to the edge of the room, standing immediately before the bright rectangle, which now filled my vision with a suffusion of blue. I looked over at Richard, who seemed to be as captivated and delighted as I was. This most unassuming of installations was turning out to be far more interesting than we had expected. I turned back toward the rectangle, which now seemed impossibly blue. In fact, there appeared to be nothing else but blue, insofar as I could detect no texture at all, no reflection or roughness that might indicate the presence of monitor glass or a projection screen. This oddity had me totally perplexed, and it gave rise to an impulse that went against my personal code of conduct. I thought that perhaps my eyes were betraying me, and only the employment of another of my senses could resolve my confusion. I had to…touch. I looked around surreptitiously and saw no one who might observe my transgression. Just a tiny touch, I told myself, just the barest whisper of a finger will tell me where all this infernal blueness begins, and then I can put my mind at rest and move on to the next installation. I cautiously drew my right hand up to my chest, attempting to conceal my movement, and then I tentatively reached forward. In my concern to meet the blue rectangle with the lightest possible contact, I was moving slowly, so slowly that it seemed to be taking a very long time for my outstretched fingers to touch the surface. I moved my hand further, then further still, until it almost seemed that I had reached beyond the plane of the rectangle. Emboldened by this bizarre circumstance and now more puzzled than ever, I extended my arm to its full length, whereupon it became obvious that I was reaching through a rectangular hole in the wall, though how that was possible was not so easy to discern. I had to poke my head through the window in order to discover that. 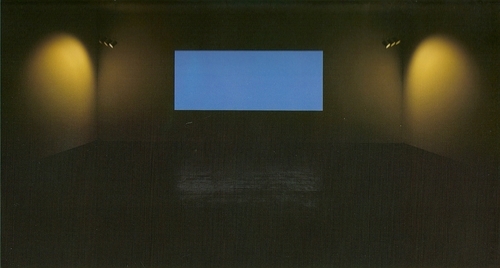 Turrell’s spectacular perceptual illusion was accomplished by constructing a false wall with a rectangular aperture ten feet in front of the real end of the room. The entirety of the resulting compartment was illuminated by hidden ultraviolet and fluorescent lamps, bathing the space with such an intensity of color that it was difficult to perceive the true dimensions of the tiny room. I was totally taken in by the deception, and I loved it. Ever since that winter afternoon in 1995, I have observed an additional rule of museum etiquette: experience the art first, then read the explanatory notes. It’s far better to discover the surprises yourself. Oh, and even though I actually did benefit the one time I broke a longstanding museum rule, it’s still a good idea to keep your hands to yourself. Who knows what kind of trouble I might have caused if that blue rectangle hadn’t turned out to be an open window. 1 comment on "Breaking The Rules"
This is a great example of the way learning should be. You explored, wondered and then took a moment to notice the world around you.